This report covers the period 12 February until 12 March 2019. 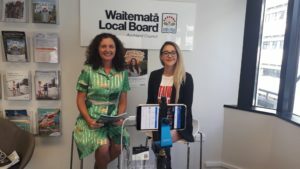 It is on the agenda for the Waitematā Local Board business meeting on 19 March 2019. The Ellen Melville Centre acknowledged International Women’s Day on 8 March with this wonderful mural (picture below) celebrating Ellen Melville and each of the women who have rooms named after them at the centre. Council’s annual budget consultation started on 17 February and continues until 17 March. This is the community’s opportunity to give feedback on whether we have got our local board priorities right. 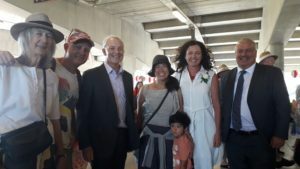 We’re not proposing major changes to the existing work programme for 2019/2020 as we continue to deliver the projects identified in the 2017 Waitematā Local Board Plan. Developing 254 Ponsonby Road as a civic space remains our major local initiative. Activating, improving and renewing our parks, guided by our Park Development Plans, will continue to be a focus. 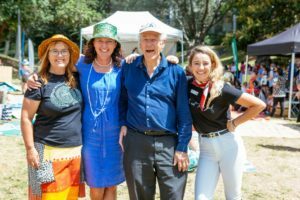 We will improve the playgrounds at Western Springs Lakeside Park and Home Street Reserve, provide pathways in Basque Park and commence building the Grey Lynn Park changing rooms. Our waterway restoration projects will continue, and we will seek opportunities to implement initiatives to enhance the Western Springs-Meola-Three Kings Aquifer. Through our grants programme, we will support community and arts groups and local events, as well as stage our two flagship events; Parnell Festival of Roses and Myers Park Medley. We are funding an arts partnership with TAPAC and increased library hours at Grey Lynn Library and the Central City Library. We will also continue investigating opportunities to reduce agrichemical use, including advocating to the Governing Body to take a regional approach to agrichemical-free park maintenance. Chair’s message from the consultation material Attachment 1. 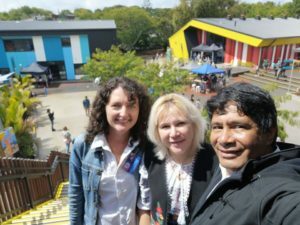 We have held an extensive range of engagement events including, for the first time, a Facebook live session hosted by myself and local board member Adriana Christie (photo right). As at 11 March the video has been viewed over 4,400 times. Consultation started on 28 February on Auckland Transport’s proposals to reduce speeds on 10 per cent of Auckland’s roads (including the city centre and residential streets in Freemans Bay). All the evidence shows that safe and appropriate speed limits save lives regardless of the cause of a crash. 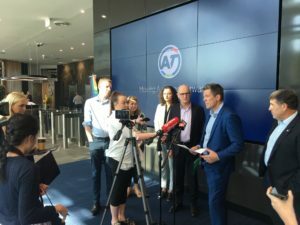 I joined AT CEO Shane Ellison, AT Board Chair Dr Lester Levy, Councillor Chris Darby and Rodney Local Board member Louise Johnston for the media announcement at Auckland Transport. (Auckland Transport’s media release Attachment 2). Feedback is open until 31 March. In response we also received the following update from Community Facilities regarding water quality. Thirty-five barley bales were installed at Western Springs by 8 October 2018. A proactive inspection regime to remove or rescue dead and sick birds began on 18 October. The shorelines are inspected each Monday, Wednesday and Friday, commencing 18 October and continuing through summer. To 22 February 2019 six dead birds and six dead fish were located and removed. Three sick birds were seen but were unable to be caught. The dead and sick birds were located during inspections; no reports from members of the public have been received for sick or dead birds, and only one report of a dead fish (which is included in the total of six) at Western Springs. Contractors completed a scoop of built-up algae and debris at the water’s edge on 12 February and are attending each Friday to inspect and remove the algae and debris as needed (the inspection includes the two weirs). A large volume of fallen branches and general litter had accumulated below water contractors completed removal on 21 February. Panuku Development Auckland has applied to the Auckland Council for resource consent (coastal permit) to carry out upgrades to the eastern Queens Wharf cruise ship berth to provide for the mooring of cruise ships up to 362 metres (Oasis-class vessels), involving construction of two new cruise ship mooring dolphins located at distances of 49 metres and 82 metres (to the centres of the dolphins) north of the northern end of the wharf, a gangway connection including hydraulic retractable gangway and security gates, strengthening of the southern end of the wharf, seven new additional wharf bollards on the eastern side of the southern end of wharf, and additional fender clusters on the eastern side at the north end. Deputy Chair Shale Chambers and I presented at the hearing to oppose the application on the basis that the board wishes to see Captain Cook Wharf developed as the primary cruise ship terminal. 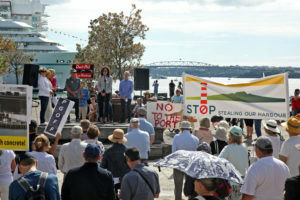 I was also invited to speak at the “Stop Stealing our Harbour” protest rally on 10 March. As a matter of principle the Waitematā Local Board doesn’t support freedom camping in central Auckland’s parks and reserves. However, the Freedom Camping Act doesn’t allow us to make a blanket ban so three locations went out for consultation until 18 February (photo right Coxs Bay reserve). to reconfirm our original recommendation for Newmarket Park to not be scheduled in the bylaw and continue to apply the default position under the Reserves Act. 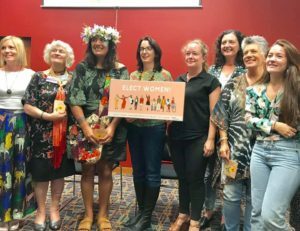 Joined a panel discussion at the Elect Women workshop organised by Women in Urbanism on 23 February at Central City Library (photo right: Elected members who spoke at the event together with Emma McInnes, organizer).